A collection of our standard puzzle designs with 4 to 10 precision cut pieces. 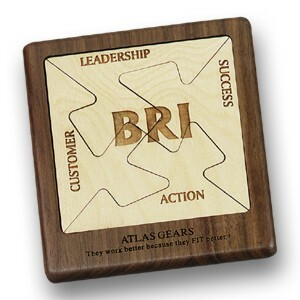 These wood puzzles are some of our most popular products. Included in the price is laser engraving of the entire birch area of the puzzle pieces (light wood area). The 1590-stnd, an option for every puzzle shown, is a convenient way to allow your puzzle to stand upright. Price includes a one position laser engraving and an attractive burgundy tuck fold gift box. Laser Area: 4" x 1/2" (base), 3 3/4" x 3 3/4" (puzzle), 3" x 3" (pocket).